What a whirlwind three weeks. The promotion of a “parent” means we hardly have any sleep. They say sleep deprivation is the worse kind of torture and I think I understand why! Many of my friends ask me if it was true that when a mum sees her baby, the pain is forgotten. My answer to that is….. no. Contraction pain is like cramps, except it grows in intensity and later on, frequency. It is also called labour for a reason- pushing really takes energy and technique. The pushing pain is very different to contraction pains, since the theory is that we are working with the contractions to push. It takes stamina and strength. I was sweating buckets. Hubby told me after that the room was cool but all I recall was feeling really hot and sweaty. The pain that I remember most is the recovery. Coming back from theatre, I had to wear special socks to prevent DVT. I have a borderline blood disorder that makes me slightly more susceptible to clots, plus the heavy duty epidural for the surgery means this risk has increased. The socks were uncomfortable and it came with a pump which is suppose to increase blood flow. I felt stuck to bed. Once the epidural starts wearing off, slowly and surely, I begin to feel the soreness and tenderness. One good thing is after delivery,the hospital staff is very willing to provide pain relief and at that point, I had to take some. Holding Asher was difficult but I managed to later that afternoon and breast feeding began. It wasn’t ideal as I couldn’t begin breast feeding soon after he is born. Luckily though, Asher was keen and a few days later, my milk came in. Within 6 hours, I managed to get out of bed and walked a couple of steps. The next day, I managed to shower. I still couldn’t move smoothly and needed the midwife or hubby’s help to carry baby to me. The pain in day 3 appears to be the worst, and I was tired easily even though all I did was to feed Asher , eat, sleep and walk around my room! However, by the end of week 1, while I was still waddling and feeling weak, I could get out of the bed smoothly. Fortunately, physiotherapists at the ward provided ultrasound services which helped quicken recovery for tears. I stayed in hospital for 6 days (as Asher had jaundice) and I received physio treatment for 5 days. That, ice and pelvic floor exercises helped. Oh and a soft cushion on a hard chair! While I did not forget the pain, I did not forget the joy either. I’m still a little in disbelief that we have a son. Or the amazement that he was in me just a mere 3 weeks ago. While I’m still not fully recovered, and goodness know when I can return to the gym, at least I can walk and move better now. To change the topic drastically, I wanted to share this recipe before I delivered. I made this in a week before Asher was born. When I was on leave, have plenty of sleep and had a big tummy. 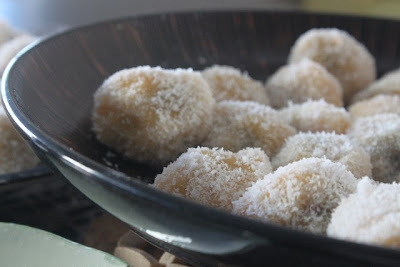 These sweet little things are kuehs. Kuehs are not really a dessert but a tea time treat. In all honesty, I have never had this kueh before. 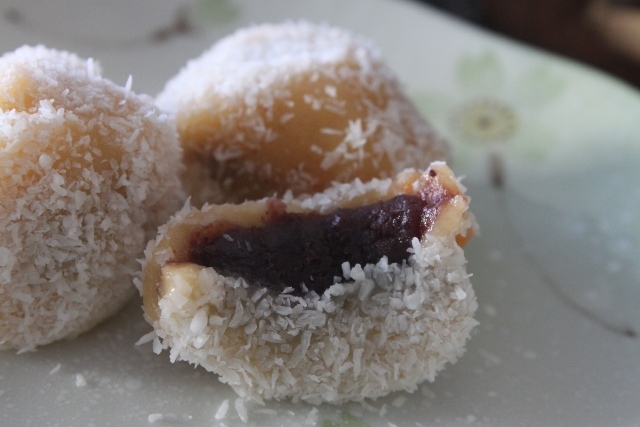 I saw it in the recipe book by Andrew Koh “Nonya Kueh Passions”. I think it is probably a modern version of ondeh ondeh. Chewy on the outside and a sweet red bean paste on the inside, I was pleased with the outcome. The recipe did not state how many one can made. It reckon I made 80 of them!! Hubby had to take them to work and I was giving them away to other friends. Mix desiccated coconut with salt. Set aside. Steam or microwave the red bean paste so it is slightly warm and soft. Mine was a pre packaged from the fridge. Mix wheat flour and warm water together till it form a cooked dough. Place this dough with rice flour, sugar, water, sweet potato and butter together. Blend till a dough is formed. Divide dough into tablespoons. Wrap a tsp of red bean paste in the dough. Cook the dough in a pot of boiling water. It will float up when it is done. 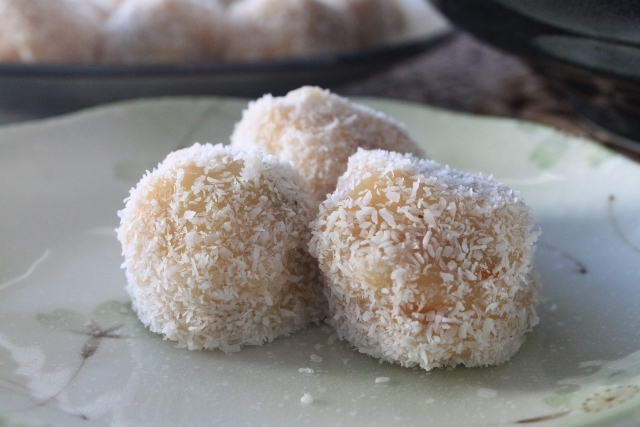 Coat it with desiccated coconut. This entry was posted in Parenthood, Pregnancy.